Picture an expansive woodland garden under a canopy of tall sugar maples. Hear the crunch of their fallen autumn leaves underfoot and the soft babble of a cold narrow brook running towards a tranquil shaded pond. Feel the warmth of the sun on your face in the vegetable garden bordered by a horse farm. These are the sensory experiences of Marjorie Anderson's country garden in Westfield. Marjorie and her husband, David, bought their ranch-style house on a ten-acre wooded parcel forty years ago. "We fell in love with the property," Marjorie explains, and the love affair still continues today. After spending her childhood living in China, Japan and England while her father worked for Shell Oil, Marjorie and her family returned to live temporarily with her grandparents during World War II. Their frequent moving provided Marjorie and her sister with exposure to different cultures and school systems. "We attended American, English, and European schools in China and an Australian school in Japan after the war during the Australian occupation." They returned to live permanently to the States and settled in Richmond, Massachusetts in the Berkshires when she was thirteen. Marjorie found attending American high school was a bit of a culture shock after spending years overseas. Marjorie's first gardening experience was in her grandparents' Victory Garden during the war. Their garden was planted not only to provide food but as part of a town-wide competition. The town fathers came around periodically to judge the gardens and award prizes as incentives to grow bigger and better gardens. "As kids my sister and I were made to go out and weed the garden because the judges were coming," Marjorie relates. She wasn't enamored of the need to have a showy garden. However, she learned a lot through osmosis. The family had a huge garden and did a lot of canning. Combined with dairy they were pretty much self-sufficient. It became a whole neighborhood affair to pick peas, pop them out of their shells while sitting on the front lawn, and then can them. "This week we're doing peas!" Those experiences taught Marjorie the rudiments of gardening and canning, and she became an expert as an adult. Marjorie also became the mother of two boys and a teacher (mostly of music) for individuals, her church, and later for the Master Gardeners. Her boys were active in 4-H, and they raised chickens, hogs and steers for family consumption. She became involved with the MGs in 1989 and was part of the last class of the UMass Extension Service program. Once she started, she realized what a great opportunity it was. "It was a great group of people, and we didn't want it to die," she says. At first, it was a social outlet with trips to botanical gardens and such, but the group came to realize the organization would wither with attrition if they didn't do something to keep it going. "We met at each others houses. We did things by the seat of our pants. This was all before technology, so we did our business on the phone." They spent hours coordinating the classes and teachers for the MG course, and they employed the first class graduates to organize the first symposium. "I think we became a stronger group having to do things for ourselves. We had to make it work!" She believes in the MG mission of outreach to the public and appreciates the esteem people have for the MG's knowledge and expertise. She indeed is humbled by that respect. "It's nice to be able to help people out doing something you love to do yourself." And she is in awe of what the organization has become over the years. Although Marjorie is no longer very active with the MGs, she is involved in interviewing candidates for the 2015 class and will be a mentor next year. She looks forward to working one-on-one with her interns. We toured the three acres behind the Anderson house that the couple has developed over the years. Marjorie and David divide the work on their property. While they no longer raise animals and only a few Christmas trees remaining from their former tree farm, they are still quite busy. David mows the grass paths that meander through their woodland garden, manages their seven-acre woodlot for their wood stove, and maintains the compost piles. They have enough wood stockpiled for the next few years. Marjorie concentrates on the vegetable and fruit gardens. 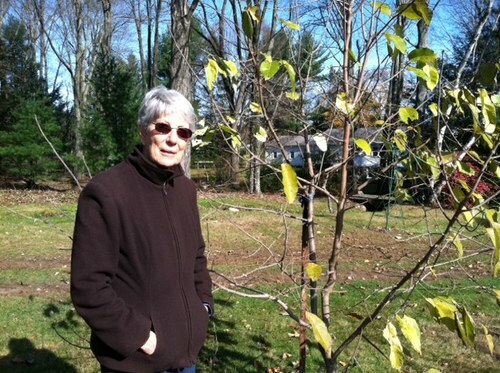 For fruit, she grows persimmon, apple and pear trees, blueberries, strawberries, and yellow and red raspberries. She likes the Heritage variety and prunes them for fall production. She explains she likes the fall crop because not only is the rest of the garden keeping her busy in June, but the Japanese beetles are coming out in force then. And the raspberries are abundant! From her 25' row, she harvests enough berries to eat fresh, freeze for the winter, give to her neighbors, and sell on the roadside. "They start producing in September, and I start selling them out front. It's my one cash crop, and it pays for all my garden seed and gardening equipment for the year. It's really amazing!" We nibbled on a few sweet berries while we continued our tour. As with most gardeners, she battles with the squirrels, rabbits, and deer that devour her pears, strawberries, and other crops. For some puzzling reason this year, the discerning critters favor the new strawberry bed of plants she received from a neighbor. Although she rejuvenated her old bed, it remains untouched, thus the mystery. The vegetable gardens sit next to the rows of fruits and include asparagus, squash, melons, tomatoes, peppers and more as well as kohlrabi, beets, lettuce, and spinach, and Brussels sprouts that were still producing in early November. She grows the sprawling plants in small round gardens a distance away so they can grow uninhibited. A neighbor keeps bees on the Anderson property and provides them with honey. Near the vegetable garden, Marjorie has a shed with an inviting bench in front that is shaded by an arbor of hardy kiwi vine. It affords a nice view of the vegetable garden and a pleasant place to take a break from gardening. David built it for her here to replace their dilapidated chicken coop. A rain barrel she purchased through a program conducted by Ellen Weeks sits on the side of the shed and behind it is a series of compost bins for garden waste. Making a full circle on our garden tour, we returned to the shady woodland garden just behind and around the house. Marjorie grows ferns, some shade perennials and spring bulbs as well as a beautiful Kousa dogwood, oak-leaf Hydrangea, and Rhododendrons here. 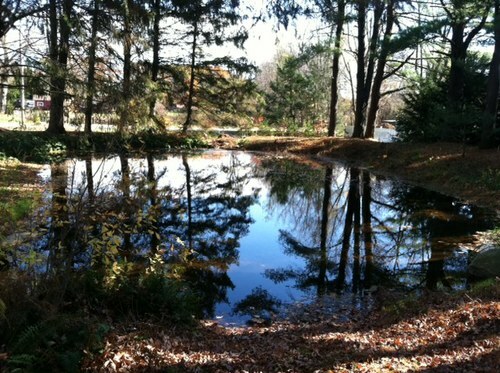 The highlight is a small brook-fed pond surrounded by white pine and hemlock trees. She recalls how there once was a path around the pond. "Our dog made the path. He could hear the frogs in the pond and used to chase them around and around the edge of it and until he made this path." The tranquility of the brook and pond is quiet and restful and can be heard through the open bedroom windows during summer nights. The Anderson property has evolved since they first bought it in the 1970s and were inspired by its potential. Early on they dug up rocks, cleared trees, and built a barn to create a mini-farm. Later they took advantage of the maple grove, cleared out the poison ivy, and designed a woodland garden by adding understory trees, shrubs, ground covers, and daffodils. And now they are scaling back a little to keep it all manageable. "It's very soul satisfying," proclaims Marjorie.